With the Watson EN-EL14A V2 Lithium-Ion Battery Pack, you can power any camera that runs on the Nikon EN-EL14A. 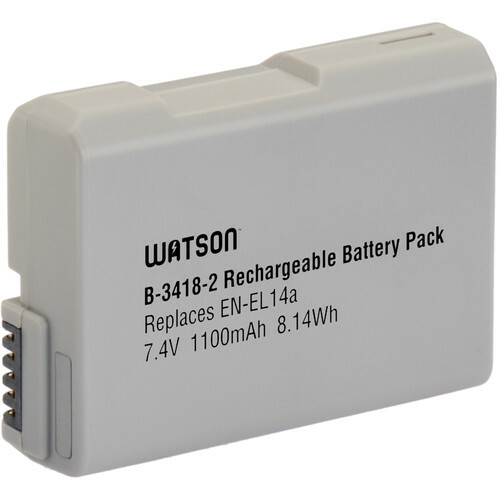 This replacement battery features 7.4V of output power, an 1100mAh capacity, and an 8.14Wh energy consumption rate. Small and lightweight, lithium-ion batteries can be charged or discharged at any time without developing memory effect. Box Dimensions (LxWxH) 6.0 x 3.5 x 1.5"
does it support Nikon D3400? Will the Watson EN-EL14A V2 operate in the Nikon d5600. I know some manufactures batteries won't? Worked fine in my D5200.